Sometimes you wonder if people do eat all the stuff we think they eat in other countries. Do Russian people really eat blini and follow them up with shots of iced vodka? In Hawaii, are people sitting around dipping their fingers into bowls of poi? 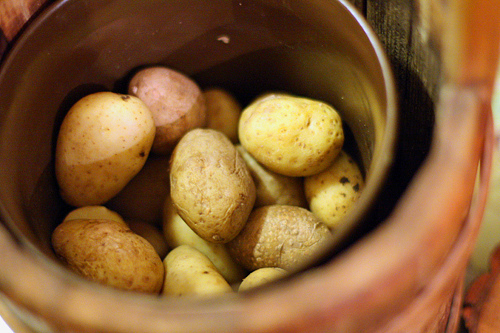 Do Americans actually eat the skins of potatoes? How many Parisians actually nibble on macarons? And is it so that Swiss people eat copious amounts of melted cheese, stirred around in pots and heaped on plates? I first heard about Raclette a few decades ago when I was working in Berkeley, and since I’m attracted to rituals involving food, when I found out the chef’s girlfriend was Swiss, I, and my co-worker Linda, started hounding her to invite us over for a melted Swiss cheese-fest. At Caveau des Vignerons in Montreux, I was having dinner in their rustic dining room all by my lonesome, not feeling very romantic, and saw on the menu Swiss specialties like Fondue and Raclette. But since both required a minimum of two people to order them—which is odd because I think I could eat a double-order of anything with melted Swiss cheese on my own—I realized that I had to order something else. Unfortunately as soon as I had walked into the dining room, the smell of sizzling cheese wafting through the air had hit me and by the time I polished off my enormous plate of Veal Zürichoise with rösti (crisp shredded potato cake, which kinda made up for the lack of sizzling fried cheese) a tiny tear began making its way down my cheek as I watched the other diners, paired off in happy couples, feasting on Raclette. Even though I was pretty stuffed from finishing off a pile of veal and potatoes, I made a nosedive into the lump of gooey melted cheese she set down before me, which was gone in seconds. She came by and offered more, which I begged off, but I started talking to her and found out she was the Gloria in “Chez Gloria“, the nickname of the restaurant, and I asked her if I could stop by the following day for a lesson in making Raclette. Of course, making Raclette by the open fire is the ideal way to prepare Raclette (although I can’t say if it’s effective foreplay, because I signed a confidentiality agreement) and there are a variety of raclette makers intended for home use. Not everyone wants to splurge on a professional-style raclette grill but I do know that cheese shops in America often rent them out so you can give it a try at home. Aside from the vehicle for melting the cheese, one uses a flat-edged spatula to scrape the layer of melted cheese off the wheel and onto the plate. I’ve seen wooden ones but I love the professional Raclette knives, and even though I would probably only use it a few times, I am putting one at the top of my Christmas wish list. The first thing to do before making Raclette is close the doors. 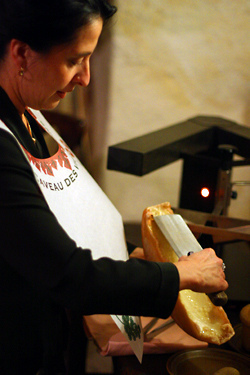 When I was sitting in the Caveau de Vignerons, as soon as Gloria started firing up the cheese melter, she walked over and shut the large wooden doors that led up to the bar. Which I thought was funny because I was sure that that locals, who sit on what have the be the most welcoming place to park your backside in Switzerland, wouldn’t be enticed by the smell of sizzling cheese as much as I was. Another point that I’d like to make is that white wine goes better with most cheeses than red. I know, I know…there are folks who disagree and that’s fine; if you want to drink red wine with Raclette or cheese, well, go ahead. But the fruity, dry (and some say ‘sour’) white wines of the region made from Chassela grapes, are often sharp and minerally, making them the ideal wines to accompany—but not overwhelm—both mild and strong cheeses. So please stop pushing me to drink red wine with cheese; I don’t want it. 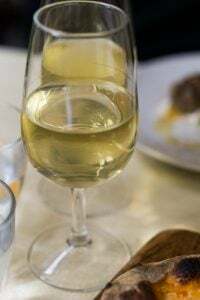 I switched to drinking white wine a few years ago because I find that I can pick up a lot of the subtleties in white wine better than in a glass of husky red wine. Of course, that’s a broad generalization but I just find white wines more interested nowadays, more drinkable, and I also don’t feel so dull-headed the next morning if I drink a little more than I should. It should go without saying that Raclette should be made with Raclette cheese. Interestingly, a local cheese shop was advertising cheese with various flavors, and when I did a little searching online, I found that versions of Raclette cheese are made everywhere, from Michigan to Australia and New Zealand. I haven’t tried them, but it’s nice to know that you can make Raclette in a whole lotta different places, not just in Switzerland. 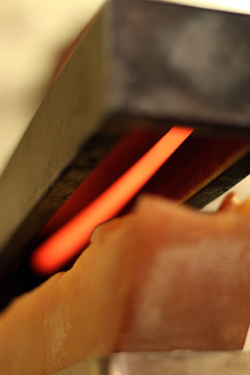 But no matter where you live, the method of making Raclette is the same: Heat a large half or wedge of Raclette cheese under a very hot heating element or a broiler, or by an open fire, until the surface is melted and beginning to form a firm skin on it (which is the way I like it.) 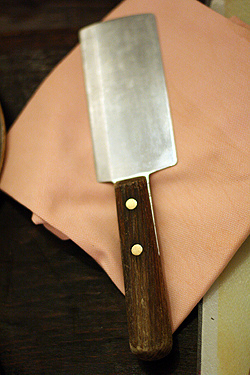 Once it’s gooey and melted, use a spatula or the back of a large knife to scrape the cheese onto a warm plate. 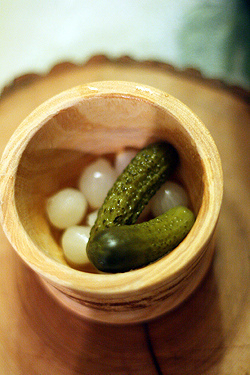 Traditional accompaniments are cornichons (tiny pickles), roasted new or fingerling potatoes, and pickled onions. There’s some discussion whether you should peel the potatoes or not. I always eat the skins but remember quite a while back when I was in Germany and I started eating the skin on the potatoes and the other diners at my table were openly horrified at what a rube they were dining with. I don’t know if that’s changed but I’ve yet to see any restaurants in Europe offering fried potato skins. At Caveau de Vignerons, they serve the potatoes in the skins on and I wasn’t picking it off. So perhaps the Europeans and the Swiss have gotten with the program. Personally, I’m not planning on buying a Raclette maker. But this winter, I’m hoping for a chance to go skiing in the alps. Since it’s been a while, I’ll probably spend most of my time warming myself around the fire while everyone else hits the slopes. And to keep me company, I might bring along a sack of potatoes, some pickles and onions, and perhaps sneak in a little bit of meat, and find a big hunk—of cheese—and have a good time all by ourselves around a roaring fire. I just went to the market to make fondue after reading your post. Now I need to go again to make Raclette- Good Lord, please help my waistline and wallet while I indulge in this cheesy goodness ! ! The part where you cry is so unbelievable, I literally laughed out loud. I’m sure people everywhere, me included, would love to share a romantic raclette with you. Who knew there were such things as “raclette makers” and “professional raclette knives”! So glad you were able to experience the raclette without needing a + one to dine with you. One thing I am taking from this is that I should start tearing up in restaurants more often. Wow, you even make cornichons look good! What a fun story, David. 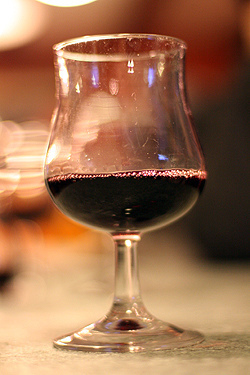 So, when are you going to share the “one too many white zin” story with us? Another great post about our hearty cheesy dishes, David! I totally agree about the white wine – nobody would ever serve red with a raclette here in Switzerland, it’s just not done. As for the meat, viande de Grisons is an excellent accompaniment, though I’ve never seen it with ham either. Glad you enjoyed! I am not a raclette eater. It smells so bad! When I was living in france as a student with a host family, I walked into the kitchen and almost vomitted because my host dad was heating up raclette in the microwave. Oh, the odor. It lingered on for weeks! Maybe if I had a romantic swiss raclette shared by the fire I would find it more appealing. Mmmmm, I love raclette. I definitely have it with smoked meats — it seems wrong not to! And pickles! For me, the one rule of raclette is you can eat it anywhere, as long as you eat so much of it you feel like you won’t be able to eat again for two weeks! A Swiss lady set up a little fondue and raclette restaurant Cairo, yes, in Egypt! “Little Swiss” opened midsummer three years ago and we thought it would bomb, but you know what, in 40C (+100F) with no air conditioning, just a fan, they were booked out for weeks! The raclettes and fondues were served with black tea because they couldn’t get an alcohol license and actually, it was very good! There was also pineapple along with cornichons (imported to get the for precision Swiss flavour!). The pineapple wasn’t my favourite – a bit too reminiscent of cocktail sticks and birthday parties when I was 5, but great meals. She imports all her cheese from Switzerland – no mean feat with corrupt customs officials and products that need to be temperature controlled. You can’t beat Switzerland, but Cairo isn’t too bad!! I so much enjoyed reading your posts on Switzerland. My extended family is from Switzerland, a little valley village called Elm, and growing up fondue and raclette were both very special traditions. We have one of those raclette makers and we typically cook some sort of marinated meat (usually pork, but there has been rabbit) and vegetables on the top. Like you though, I am pretty content with any form of melty cheese (and I am all for potato skin eating). Thanks for the beautiful story and the raclette craving! I,ve been reading your blog for some time now, and I must say I love it. I never commented before but I felt I had to say someting about this lat post. You write “I’ve yet to see any restaurants in Europe offering fried potato skins”. I have eaten fried potato skins with a delicious herby, creamy sauce in a small restaurant in Lisbon, last year. That is not the traditional Portuguese way of serving potatoes but it was good, anyway. As a matter of fact in Portugal, where I come from, we do eat the skin of the potatoes: we eat them cooked,seasoned with olive oil and vinegar or, baked in the oven and served with some olive oil that have been heated with some cloves of garlic. Delicious either way. I’ve been wanting to try Raclette since you convinced me to make fondue this week! I always see it sold in slices though, and sold in bulk here at the supermarket (Casino). Yours looks much much better. Maybe I can source it at a fromagerie in Paris? On a trip to visit my cousin in Versailles, she made homemade Raclette accompanied by fingerling potatoes and some type of meat. The combination is something I have dreamed about ever since and I cannot wait to go back and eat it again. Like you said, while I feel like I could find a way to eat it in America it just wouldn’t be the same. Beautiful post! 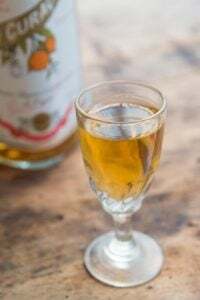 To second Anna’s comment above, our Swiss friends would insist that my then pregnant wife should drink a tissane (herbal or fruit tea) in place of wine. Apparently drinking water causes the melted cheese to harden in the stomach (but wine or tissane do not). 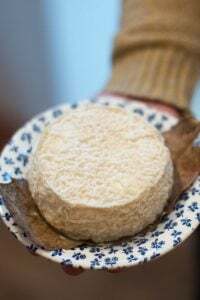 They would also ask each guest if they would like “religion” with their portion, meaning would they like some of the (stronger flavoured) rind added. Clearly it was a matter of taste. It is a lovely meal to share with friends, as it is special yet very informal. I agree with you re: the wine. We always have a white, generally an Alsace, but tonight we’ll be having a Savoy white, apremont I believe. I can’t wait. Melted cheese, good wine…it all makes for a great night! We love to make raclette and do so as often as we can. We also offer it as a special at our Bistro Des Copains in Occidental, California during the winter months from time. The way we do it there is with small cast iron frying pans. We cover the bottom of the pan with sliced boiled potatoes and then cover it with raclette cheese and put it in the wood burning oven till golden and gooey and serve it with cornichons, pickeled onions and some dried meat. Our guests love it. Too bad, the Swiss raclette cheese which is the best is so expensive compared to the French raclette cheese. Thanks for the great post. Your beautiful raclette looks just like what I had in Switzerland. But some Belgian friends made us this fabulous raclette http://frenchletters.wordpress.com/2009/12/09/french-lunch-a-bunch/ and now I’ve just bought the raclette maker and an 8 pound wheel of raclette cheese (from igourmet.com) so that I can do the same at home. I love to have the variety of add-ins. Try it! Without a doubt, one of my very favorite meals. We’re Swiss on my mom’s side and we all went to Switzerland to explore our family roots. Traversed the country eating raclette and drinking the incredibly wonderful Swiss wines. I love the land I came from! Raclette is so delicious. Somehow my Raclettemaker got lost in the move from Germany to the US. I miss it. Unfortunately the Raclette cheese is also outrageously expensive here otherwise I would have already replaced it. Yes, go skiing in the Alps again. Not that our Beaver Creek or Vail have to hide, but it is such a different atmosphere skiing in Austria, France or Switzerland. I enjoy it a lot. Especially the food in the “Huetten” (Jagertee and Germknoedel, yummy!). Our Swiss friend always chooses a delicious selection of sausages which she thin slices and then places on the top of the raclette maker with potaoes and veggies. I have to remember to stop eating before full, as the combo of potao, cheese, meat turns to a double sized lump to digest. It’s worth it. I had the amazing experience of eating raclette in someone’s home in Switzerland, which he prepared in front of his enormous fireplace, and very fun and delicious it was, too. My friends in Germany have one of those electric raclette makers and always serve it on New Year’s Eve. We spent the day sightseeing and then came home about 6:30. My friend set out onions, cold boiled potatoes, pickles, and then plugged in the raclette maker. Dinner for ten was served in less than 15 minutes! What can I not say about raclette? It’s one of my favorite culinary traditions. Skiing in the Alps and then gorging on melted cheese, bread and wine apres-ski is one of my most favorite memories– and it almost makes you forget about your throbbing quadriceps! I have made fondue before, but have never done raclette. I will have to try! And yes, for the record, people in Hawaii do actually sit around and eat poi via their fingers. We lived in HI for a year and witnessed this phenomenon. Wow. One of my favorite travel/eating memories was a cold night on a trip from France into Switzerland and having raclette in a cozy restaurant. A big wheel of cheese by the fireplace, a bowl of potatoes, some kind of meats and oh my god!!!!! I will never forget that night. hehe! what an entertaining post. i always feel like your posts take me to the places you describe. i have had the amazing experience that is raclette, but it’s been a while. this took me back to some good times. 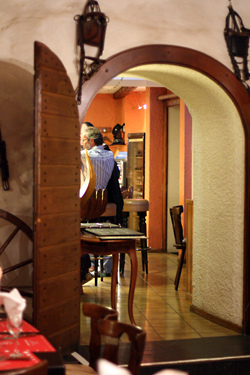 Oh… and a good (but touristy) place to try Raclette and Cheese fondue is in Gruyère. They have fantastic cheese and all the stuff you can make with it. Yes, Russians eat lots of bliny! 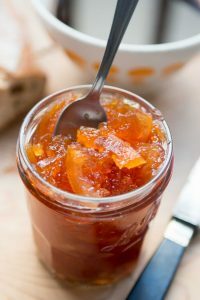 Usually with jam, cottage cheese or syrup. But they serve them with tea, not vodka. My mum makes bliny every saturday afternoon. FYI: While not everyone who lives in Hawaii eats poi, it is still very much a staple for native Hawaiians. Your post reminded me of Schoggi, that hot chocolate (made with real chocolate) that the Swiss all seem to love. I have a fine recipe, but it just never tastes as good as what I got in Switzerland–but good enough though! Maybe I should try it by a beeg fireplace with somebody I really like? I clicked over to Epicurious to get more ideas for Fondue for Christmas Eve (an idea completely inspired by your last post). And what do I see, but your book “Ready for Dessert” on their list of six books to get or give. A very well deserved congrats to you! When I was at a friend’s house outside of Paris, she called some people over and prepared raclette, which she served with potatoes and lots of meat – ham, bacon, a whole range of cold meats. Poor vegetarian me stuck to the potatoes, which I ate with the skins on, because yeah, I like potato skins. I was also on the receiving end of gasps of horror. She actually had these grill things, they were round and had some sort of an electric or gas fire in the middle, and there was a ring under it, and the diners put slices of pre-cut cheese into their spatulas and stuck it into the ring under the fire to melt. I hope there’s nothing wrong with me. I read this blog like my life depends on it. 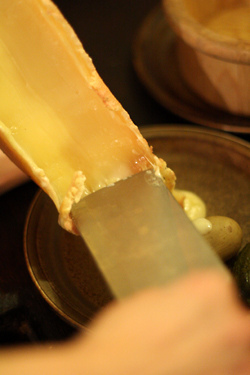 Raclette can be found on our dinner table a couple times a month during the fall and winter. We were introduced to raclette while visitng family in Paris a few years ago. I was worried we would not be able to re-create the magic back in Texas. Fortunately, I found a raclette grill at Sur la Table and raclette cheese at Central Market. Baguette, fingerling potatoes, dry sausages, cornichons and white wine round out the meal…ahhh. Even in Texas! The only time i had raclette was in the French Alps, on a cold winter evening in front of a blazing fireplace and yes, with plenty of white wine (after sipping on vodka for 2 hours). In addition to potatoes, i remember we had prosciutto. It was all very delicious and special. I’ve been following your fondue and raclette blogs with interest. When I took my nieces to Paris in March, 2004, we found ourselves at St. Julien le Pauvre buying tickets for a Vietnamese Contra-Tenor concert. It was dinnertime and we were all very hungry. With only an hour or so until the concert began, we needed to find a restaurant nearby. Rue St. Severin is a VERY touristy street which also happens to have three or four fondue/raclette restaurants. We picked one and all three ordered the cheese fondue. I ordered the “formule” and got a green salad with tomatoes and Robachaud (sp???) cheese on little rounds of toasted bread. Delish. The fondue came with a selection of 3 meats—country ham, salami, and regular ham, a basket of stale bread to dunk, cornichon pickles, and honest to God, surely two pounds of little roasted potatoes. Heaven on a chilly March night but it’s a wonder that we stayed awake for the concert. I took a photo of Le Grande Bistrot after the concert and on the way back to our hotel. I am pretty sure that it was the restaurant we chose. I seem to recall an entire roasted pig on a spit in one of the windows. I agree that chicago dogs and nutella banana crepes are just aren’t the same at home. 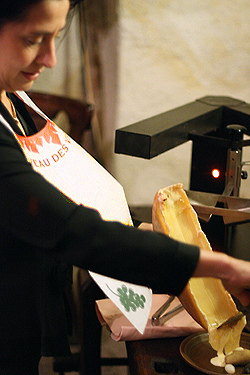 I’ve never tried raclette, but it’s on my list- even if it won’t be as good as in the Alps! Thanks for an entertaining and mouth watering read! The reason for melting it by the fireplace? You get the smoky flavor! I’ve always looked longingly at the raclette sets you see at specialty food stores here in the States, but unable to justify the expense and space it would take to have my very own, I make do with my two (2!) fondue pots. When we went to Paris earlier this year I was delighted they had it at half a dozen restaurants near our apartment. Funny enough, neither of us knew how to actually put it all together. Did we pour the cheese over the potatoes? Put them in the little dish to warm? A nice family saw us pointing to the food (we most likely looked like cavemen to them) and leaned over to instruct us. They continued to check in as we sat there and make sure we were melting the cheese correctly. So I don’t think I need to get my own set, but we’ll never forget that fun night, the hospitality and the gooey cheese. I would like to thank you. For my birthday, our daughter baked “Crack Pie” which she copied off of your web site…Yummmm..That plus Mario Batali’s short ribs and two recipes from Jaime Oliver..A menu inspired by my favorite chefs…Merci beaucoup. I was introduced to raclette by some French friends living in Bretagne. They did serve a platter of thinly sliced dried sausages and ham on the “side” with the raclette. Louise sat a large bowl of potatoes on top of the grill to keep them warm(new potatoes fresh from their garden, with the skins on). When my husband and I returned home to the States, we immediately ordered a raclette grill and started treating our friends to raclette parties. We made our own adaptation….we drizzled olive oil on top of the grill and placed an assortment of thinly sliced onions, red and green bell peppers and sliced mushrooms to grill…..hmmmm the smell was devine and the veggies were wonderful on the melted cheese and spuds. We started loaning out our grill and then bought one for a couple we know. They have since had their own parties, using their grill constantly (they’ve probably gained loads of weight). They told us that the raclette brought their father back into their lives as he loves to come over for a meal. Long live the raclette!! I did eat raclette at a friend’s house in Saudi Arabia. It tasted pretty good! I think you are right though, for instance the Italians have exported so many of their staple dishes worldwide but it still tastes better in Italy. raclette, I never see it before, I am so love it, it must be good taste. at my city, here no one sale cheese, they don’t eat cheese, they love eat gong bao ji ding, yu xiang rou si,etc.more Chinese love eat this two dish.but i love to eat cheese, chocolate, ice cream. a little different with them. thank share you blog. Between your fondue post and this raclette post, I discovered “The Complete Book of Cheese” (1955) by Robert Carlton Brown in e-book form by Project Gutenberg. 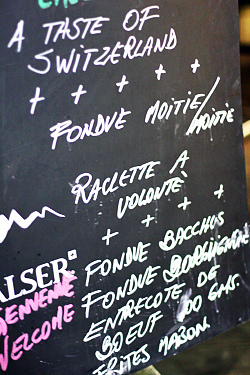 It has several (18) recipes for fondue including one for “Vacherin-Fribourg Fondue”. This recipe has butter, garlic, Vacherin cheese, and hot water. Some recipes are somewhat questionable-sounding from the name: e.g., “Quickie Catsup Tummy Fondiddy”. The book covers some interesting early history of cheese in America. 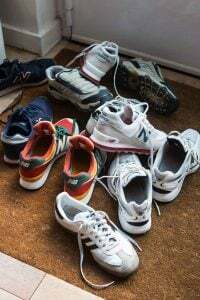 It’s an interesting read plus I learned a new word… turophile. In London, might I suggest a trip to the Borough Market (in the south of London)– where a lovely man makes the most delicious grilled cheese sandwiches and raclette. Both of which you eat while walking around this large, old market, or you can sit on the steps or ledges of the local cathedral if you need both hands…. I can vouch for both sandwich and raclette, but I wouldn’t suggest trying them both on the same trip. 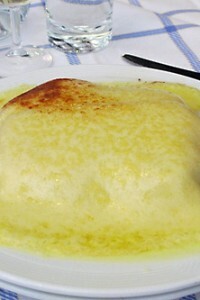 For the raclette and sandwich, see http://www.kappacasein.com for pictures etc of a happy cheese man. I am the lady that said Hi! to you and grinned like a fool and ran off the other day on rue Montorgeuil. I didn’t see you coming until we were practically bumping into each other, and I immediately recognized you like an old friend. But coming from L.A. I know how the “well knowns” don’t like to be fussed over in public, so I just moved on like an idiot instead of saying, Hi David, how are you! Great Coat (and it was a great coat!) You looked very handsome and rested, unlike when I saw you at the booksigning where you looked like an exhausted prisoner pinned against the window. Anyway, it was just starting to rain yet again and I had a full, heavy cart and was racing down the street trying to make it home before I got soaked and there you were in front of me before I knew what to do. I thought perhaps you were leading a small tour, but I didn’t even ask! Well, I didn’t handle that with any grace! As to raclette, once when I was visiting a friend living in a little village in Burgundy called Frolois, she took me to some British friends’ house and they were all excited because they had just purchased a raclette maker? It was some sort of metal frame that carried different little trays that you melted cheese in at the table one at a time. Very like fondue, but It seemed like a lot of work to me. Might have been their particular unit. That is the only time I have had it. So to me, its French Burgundian! i am currently living in lausanne, switzerland and montreaux is not too far off. i read your entry and now i want to go try out the restaurant during my free time! i’m really excited!! thank you. Raclette is one of my favorite foods! Discovered this treat years ago in Klosters. 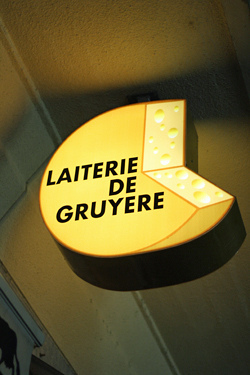 Later frequented a tiny hole-in-the-wall restaurant located somewhere near Boulevard Sebastopol in Paris. Hmmm, wonder if it is still there. Now I do a lazy-woman’s version during the winter months here in New England. Crusty slab of bread, cut the raclette in thick slices, place atop the bread and melt & toast under the broiler. Sprinkle the melted results with cracked black pepper or cayenne. 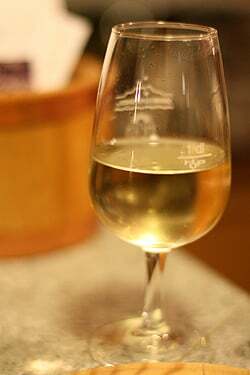 A glass of Riesling or Gewurztraimner! Bliss! Reading your blog, then reading all the delicious comments from around the world makes me tear up… but I soldier on anyway. One of my French friends has a raclette maker and she makes it for me every time I visit. I would love to have one of the little trucs, even if it does take up space and I probably wouldn’t use it that often. I could look at it longingly and remember my wonderful raclette experiences and sip a nice chilled white wine. How can you go wrong with boiled potatoes, skin on, and gooey cheese? Pas possible. Ah come on David, you’re killing me here! 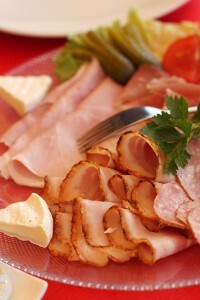 I eat everythng your wrote about in your first paragraph, am longing for all of the above, BUT, most of all Raclette!!!!! In days gone by sitting around in the Zermatterhoff eating this delicious plate of cheese and the rest was so memorable. How do you think this stuff up? Now I have to go and eat a plate of lentils as I’ve not prepared a proper lunch today! Yech,….albiet I live lentils but not after reading this article. This cheese and the little tiny potatoe with a glass of CHAMPAGNE is to die for! And then the blini with the shot of vodka, nasdrovia….SO good….ok, on to the lentils. Keep up your great writing. Am on my way to Buenos Aires where it will indeed be warm and will be eating SO WELL as one does in the GRAN CAPITAL of Argentina. Although I love raclette and no skiing trip in the Alps would be complete without a raclette evening in a cosy local restaurant, I have so far resisted buying one of those electric raclette grills as I’m sure they would soon join my almost-never-used fondue sets. A great alternative is melted Vacherin Mont d’Or – I just take the lid off the wooden box and put in in a hot oven, then everyone scoops out the melted cheese at the table. I serve it with new potatoes, cornichons, a selection of dried meats and good bread, just like raclette – the perfect winter meal. And I’m with you on the white wine David, much more interesting than red. Love raclette. First had it in a restaurant near Gruyere. One of those special meals one never forgets. I also bought my raclette maker from Sur La Table and have used it to make special meals. I love the idea of offering some veggies along with the potatoes. I put sliced sausage on top of the grill. The only thing that doesn’t taste the same are the wonderful pickled onions. I haven’t had any here in the States that taste like the ones in Switzerland. Thanks for bringing back fun memories. I actually tried Raclette at an underground food market in San Francisco about 4 months ago. It was served with amazing roasted potatoes. I can only imagine what it’s like in Switzerland. Dee-lish. Thank you for reminding me about Raclette. It’s just not something you see very often in Washington, DC, but it’s such a wonderful meal for the cool fall days we’ve been having. I’ve actually used one of those commercial Raclette machines before and it worked quite well. Great for parties. The guests love it. My family’s Christmas Eve tradition for decades has been Raclette and champagne in front of an open fire. It’s just fabulous – a luxurious, slow meal that gives us all time to talk and laugh. Of course, as we’re all aging, it’s getting more and more difficult to stand up after sitting on the floor in front of the fireplace for hours (and not just because of the champagne). But still … worth it. Andrea: I’ve never warmed a Mont d’Or because I like it so much just as is, when it’s perfectly ripe. But some people do tip a bit of kirsch in them and heat them up. Kathy: That was funny because I thought you were someone I met at a party or something and didn’t recall! Nice to know I’m not losing my mind ~ hope you had fun in Paris in spite of the inhospitable weather this week. Lucky me, I received a Raclette machine (the one with little trays) from my Swiss friend a few years back. Every year, the day before Christmas, we have a Raclette night and we stuff ourselves silly. Of course we have lot’s of pickles, onions, potatoes to accompany. And when we wake up the next morning, the whole flat reeks of Raclette! But it’s worth it – as you know! I’m from the French Alps (Haute-Savoie), and in my family we always eat raclette with an assortment of hams (jambon blanc, jambon cru, viande des Grisons, rosette, pancetta…even (French) bacon), cornichons, onions, potatoes of course, and that’s all. Oh and sometimes my mother cooks some pumpkin to substitute the potatoes, and make it a lighter meal! The other important rule is to always eat raclette or fondue (or tartiflette) in winter…I always get sick seeing tourists in my hometown (Annecy) eating it while it’s 30+°C outside. It’s just nonsense. Speaking of fondue, I had seen that someone mentioned in your last post cracking an egg when the cheese is almost all gone, I love to do it, it’s DELICIOUS!!! Nice post David, enjoy your aaahhh skiing in the alps OK. I have been enjoying raclette since college days in Switzerland and have gone through several tray machines. My favorite is to put some diced truffle (if you can get one) or truffle oil in the tray with the cheese. It is also fun to have a cheese tasting with several different Swiss varieties. Always get some tartuffa cheese. I have found that Danish Fontina is one of the best cheese as it browns with no butter separation. Some cheeses leave a lot of oil. I have to agree on the wine assessment, recently, I’ve been drinking Additive free wine, mostly red, in Tokyo by Asahi and Suntory… and it is the most delish I’ve ever had. Oh what a delicious memory you just brought back. My mother rented a raclette maker (way back in the 70s in suburban CT) and I fell in love. After reading your last post, I’ve put a fondue pot on my Christmas list. Now I’ll need to find a good cheese shop that rents the raclette maker. May the 2011 be filled with lots of cheese! Melted cheese and potatoes – oh lordy, it doesn’t get much better than that! I had no idea we made raclette cheese here in Oz – I’ll have to hunt it down. Ah, David, so naughty, so good. 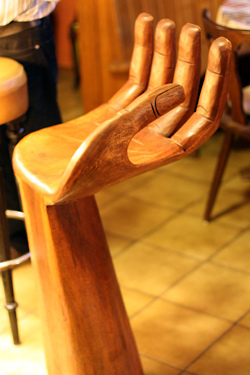 Thanks for the photo of the bar stools. My sister, Jodi (above) reminded me that we used to rent a raclette maker regularly from a cheese store on Greenwich Avenue. Ever since you’ve been tweeting and posting about cheesyness from Switzerland, it’s made me want to fondue. I may get out my pot tonight, since I’ve got a bunch of cheeses left over from my trip up to the Salone del Gusto a few weeks ago. Yum! I can’t say I’ve tried raclette in Switzerland but I did have the utmost pleasure in enjoying it with friends in the town of Samoëns (in the French Alps) and it was nothing but amazing. My experience strayed from yours in that we had quite a bit of meat and no pickles or onions. Maybe it’s a French vs. Swiss thing. 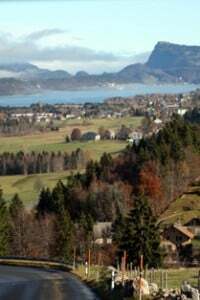 This post makes me want to visit the Swiss Country again. I’ve only been there once and I did have the raclette when I was in Zurich and it was one of the best meals I’ve had in Switzerland (well besides bratwurst in every corner of the city). And Old Town Zurich made it even more memorable. That’s when I also developed my love for cornichons. 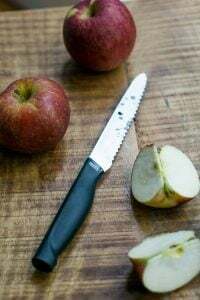 I was smiling reading your post because yesterday, on Sunday, I had Swiss guests and their in France living offsprings for a meal – and we had Raclette…. :)))) Must have been that Fondue upload the other day that made me offer them Raclette! And I am NOT surprised that you never saw the ‘viande de Grison’ with a Raclette; it is a French ‘invention’ to add Speck, dry cured meat, and other stuff. 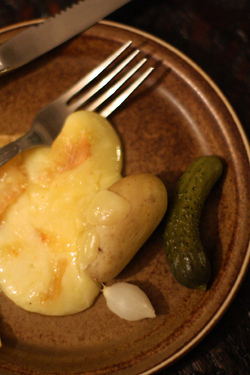 The ‘pure’ ingredients of a real Raclette are as you wrote: The best Raclette cheese, small potatoes, gurkins and/or cornichons and ‘silver onions’…. I think the best raclette is always the one that doesn’t make your house smell like a ‘Chäs-Stube’… :) And the very, very, very best raclette comes indeed and truly from a professional raclette maker, ‘raccler’ = scrape – NOTHING tastes better than a generous ‘slice’ of half a cheese. It’s just as well that I had this generous Raclette yesterday or I might once more have to dive to the kitchen larder to have a surrogate fill of something…. as it is, I am still pretty well fed from our excess yesterday! Just to let you know, yes, Russian people do eat blini ( preferably with caviar) and follow them up with ice cold shots of vodka. And they do it regardless of which country they are living in now… it is a very russian thing to do. My mouth is watering….and I’m with you on the potato skins, but my French husband would turn his nose up at them. Those refined European palates can’t handle a little roughage. I love this story! As an American family living in Southern France, we have raclette fairly regularly. All four of my children love it…really how can you not love melted cheese. The family living in our house before us left a raclette maker and it took us awhile to figure out what it was. Originally, we would have it with thinly sliced beef, but then we went to a friends house, and discovered the pleasures of potatoes and pickles too. Now, we just buy a few packs of salami, ham and jambon sec heat it on the raclette grill and serve it with baguette, potatoes and cheese and pickles. So good and so easy. We also just returned from Switzerland. We had raclette at the house we rented, but had fondue out in town. David, since you are gifted with the ability to get a restaurant owner to share secrets, can I suggest another to try for? You must know Maryann’s in Paris, the deli in the Marais. She serves an incredible orangeflower scented light cheesecake that I’ve tried for years to duplicate, but have failed at. I think it’s called a Vatroushka. 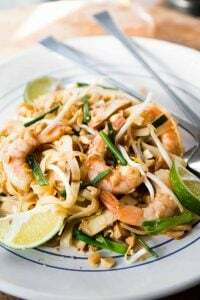 I’ve tracked down similar Russian and eastern European recipes, but none like Maryann’s. Ever had it? Ever duplicated it? Your blog is fantastic, btw. I can’t speak for all of Russia, but I can assure that that in our family at least, vodka and blini (and the occasional red caviar), is an absolute must at every get together. Blini are delicious and as for the Vodka, how else are you supposed to keep warm? Anna, IM, et al: Well, it’s nice to know that Russians supposedly do actually eat blini—and drink vodka. Clearly a trip is in order to verify those for myself! R. Michael: The best way to get a recipe is to go in and talk to the chef (eating there first helps.) So next time you’re in Paris, I’d give that a try. Good luck! Pasan: I don’t think it’s possible to eat Raclette without the pickles. It’s just not the same without them..
David, I get such a kick out of you! You’re very funny and silly (in the best way, -I adore silly goofy sardonic humor) and you talk about things that I find very interesting. 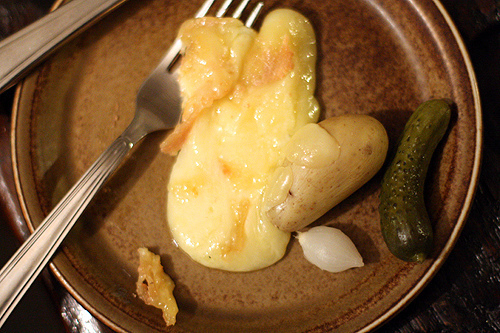 I’d never heard of Raclette in my life, but right now I’m wishing for a pile of melted cheese on a plate with a pickle. And a potatoe. My Swiss grandfather emigrated to the U.S. and lived in Southern California. Several of his siblings and some of his other relatives were chefs, both in Switzerland and the U.S. They managed to keep him fairly well supplied with his favorite cheeses. I never saw him use a raclette grill, but he would crank up the burner on the gas stove and hold a chunk of cheese over it with a long-handed fork, using a wooden spatula to peel off the nicely melted part. He ate it with nice crusty bread and sausages, and he loved to share it any grandchild who was standing on a chair supervising. It was among the best things I’ve ever eaten. At last, someone takes care to get it right. Thank you for explaining our most cherished dish to the world. 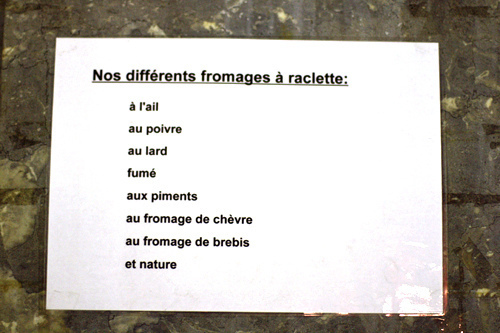 A small tidbit… the Valais is the birthplace of the Raclette cheese (which has gotten its own AOC) which in fact needs a particular percentage in fat to be ‘scraped’ properly. 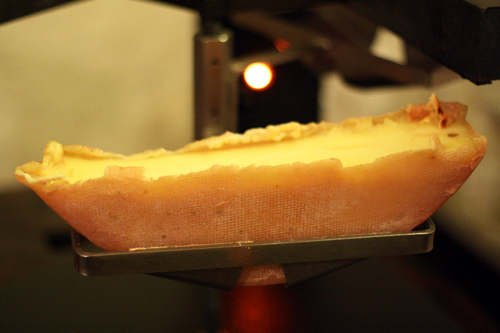 True Raclette cheese can be no older than three months (a point where the cheese changes consistence and can’t be molten as easily) and originally comes from the alpine pastures. This means that its only done from summer milk. If you ever get a chance to visit the Valais in summer, try your Raclette at the Château de Villa http://www.chateaudevilla.ch/ where they’ll have you taste five cheeses from different alpine pastures (from the south to the north) and show you the difference between pastures and their influence on the taste of the local cheese. Oooh raclette, raclette, raclette. Makes me so tremendously happy. The first time I had it was in the French Alpes, where it is typically served (or so they tell me) with everything you mentioned above, as well as dried meats, which you place carefully on top of your potatoes before you drizzle the cheese on top. Oh and I forgot to mention that my French husbands family goes nuts when I DON’T peel the potatoes. They all end up with piles of potato peel on the edge of their plates. Apparently I’m a savage. My mother would tell us a story about friends of my grandmother being horrified that we, in the US, would eat baked potatoes and potato skins (this was in the 50s and 60s) because in “only peasants would eat the potato skins” in Europe. I’ve had Raclette in Paris a few times, and for some reason had the impression that the potatoes were to be eaten with the skins on, however, it could just be that the waitstaff assumed that as an American I would do so any way. In any case your post has left me craving Raclette and thinking I really need to be in either Paris or Switzerland for New Years. In my German class today we read a story that featured Raclette. Since I was the only one who knew what it was, my instructor had me explain to the class. Sadly, I didn’t give my source of (recent) knowledge so you didn’t achieve fame in German 101. Now I want to try some! I live in NYC and went today to artisnal and had a raclette- before I came across your post. Had nothing to do with the swiss raclette(it did not have the crunchy part on top) and I had it with viande de grisson- which was incredible!!! Last time i was in paris i had such a hard time findng raclette. 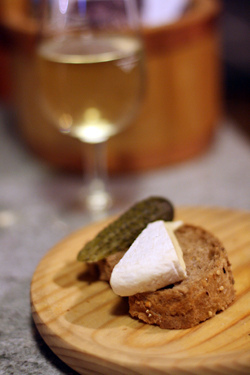 someone suggested me the restaurant pain vin e fromage- have you heard of it?